This article was originally published by MultiBriefs. ESL instructors can use photo-editing apps for unconventional purposes, such as for instructional support, for learning outcomes or to bridge the gap between the classroom and home studies. Photo-editing apps can tremendously change how students see information and how they study. Adding text, speech bubbles and images: With these features — sometimes referred as “stickers” — you can add text or cartoon images to any picture. For text and speech bubbles, you usually choose the text size, color and font style. For all text and image features, you can drag and drop them wherever you want to place them on the photo. Image filters: Image filters will make your photos digitally look better on a course management system (CMS). Improve contrast, brightness, clarity, saturation and much more. Scroll through the options and edit the photo to your liking. Use quick edit features when you don’t have much time to work on photo-editing details. Quick edits include changing resolution, colors and more. Making collages: Only a few photo-editing apps let you make collages. The app will give you the option of which collage layouts you want to use and the ability to select the specific images to use in each image box. Zooming and cropping: Zooming allows you to zoom in on specific objects or to zoom out to see the full photo. Cropping lets you cut out the background and parts of the photo you don’t want to keep, and lets you keep that parts you want. Snap a picture of class notes. Make sure your picture is clear so you can see your notes and the individual letters of the notes clearly. After class you will use a photo-editing app to change the image. You can add text to images for various learning supports. Or snap a picture of specific objects, and add text with a photo-editing app. Images can be labeled, categorized and uploaded to any CMS whether using one provided through your employment or using a free one available on the Web. Make sure you create an easy file-system name to keep track of your labeled pictures. For example, it’s helpful to use the class name, time of class, etc. You can add subject labels to class notes to help students reference the images for studying. Even if you have an interactive whiteboard, this concept can be used with classroom objects, posters and other items to upload to your CMS for students. Photo-editing apps can be used by students for assignments too. Assign them an English learning project that allows them to snap pictures and add text. Have them create comic strip photos with live people or with drawn stick figures. The student uploads the images to a photo-editing app. They then add filters, stickers, text and speech bubbles to create their comic strips. Students either take photos of live people or of hand-drawn stick figures. Hand-drawn images can be done by paper or with a drawing app. If using a drawing app, the images should be saved as a PNG. This concept can be assigned to students to create cartoon booklets slowly throughout a lesson series using a different English object on each page. Final projects can be uploaded to the class CMS. Presented below are some basic examples of photo-editing apps used for facilitating English language learning. Examples presented are for inside and outside the classroom. You will see photos of before and after to see the changes the apps made. Photo-editing apps can do much more than is presented here, but those features take more time to use. Due to the time limits most instructors have, only basic examples which only take a few minutes are presented. The above image of class notes was edited using the PicsArt app. Basic text labels were added to facilitate student referencing and studies. The image was changed using a few app filters. The text label was added, and the drawing tool was used to add handwritten text. 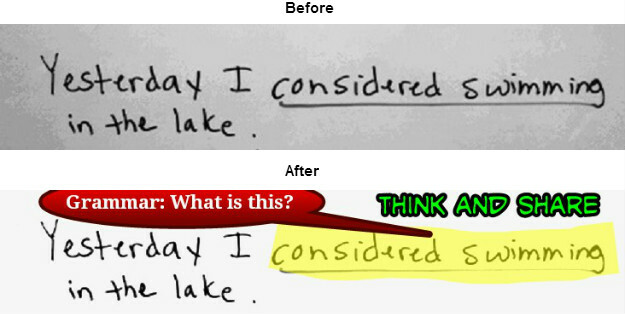 The above image of homework reminders was edited two different ways using the PE-Fotolr app. Basic text labels were added to facilitate student referencing and studies. For both images, the picture was changed using a quick filter. The text label was added, and the drawing tool was used to circle the quiz reminder. The above image of class notes was edited for student studies using the PicsSay app. The picture was changed using a quick filter. Then the highlighting, text and speech bubble was added. This was used for a homework assignment uploaded to a CMS. The above image was drawn with the Draw! app. The same idea can be done by drawing stick figures on a piece of paper and taking a picture of the drawing. 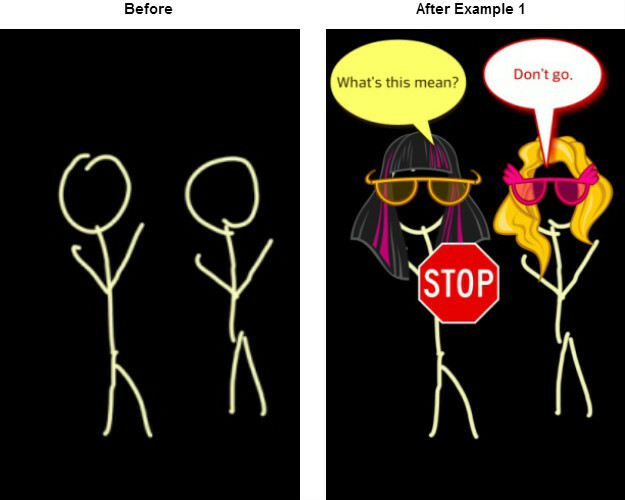 This image is a basic example of how students can create a cartoon with a photo-editing app using pictures of stick figures or live people. The sticker icons and speech bubbles were added using the PicsSay app. 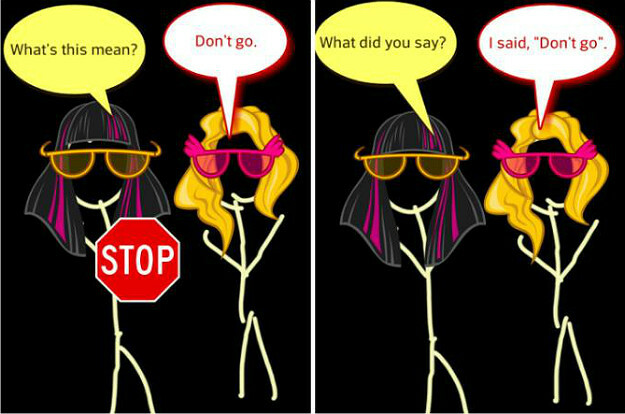 Or students can take the same images and create a continuous cartoon conversation such as in the basic example below. Separate cartoon images were created using the PicSay app. Then, the images were uploaded to the PhotoGrid app to turn into a collage. The PhotoGrid app can also be used to add backgrounds to individual images. The collage feature can also used to make a widescreen image spread of anything — class notes, objects, assignments, etc. This is a quick introduction to basic photo-editing app features and how those features can be used by ESL instructors. You may think of other ideas that are not addressed here. Download a few apps and play with the features. Brainstorm creative ways that you might be able to try the features. Keep the apps that are good, and delete the ones that are bad. Once you begin testing the apps, you will find that they can enhance your instructional toolkit in ways you probably never thought of.